"Mommy, I know what I want to do for Religion class today. Can we work on the prayer? You know, the one asking for me to be a nun?" Sadie closed her math book and looked at me expectantly. We've finished our religion program for first grade and while I have another program picked out to supplement the current program for the rest of the year, I haven't printed it out yet and so I've been doing our religion lesson on a day by day basis, some days learning about saints and other days reading stories from the Bible. When I handed her the book, with it's thin, foil edged pages, I didn't expect her, amid the many prayers between the black leather covers, to be able to find the one prayer that she'd found while we were flipping through it yesterday (she had immediately and enthusiastically asked me to pray it upon learning what it was meant to ask). And then she listened very closely, repeating some of the words while I prayed it, before we went on to the next part of our lesson (which involved her asking a question that caused me to have to go onto the Vatican website to find the answer, which thankfully came up as the #1 hit when I googled what she was asking). So I guess if I'd wondered if she was still as passionate about growing up to be a nun as she was three years ago the answer is an adamant yes ("Cloistered." She tells me. "And Carmelite."). On her third birthday she wanted one thing and one thing only. A nun birthday part and a nun dress. Oh and that prayer. She knows it's "really long" (it takes up another entire page in the book) but she'd appreciate it if we could memorize it together. That might take a while... although I have a feeling she intends to make sure I say that prayer every day for years to come! I hope I'm still blogging then too (it would be so neat to have a record of all the years in between!). And I love that prayer too, and will admit that I've definitely said it from time to time! I would skip the majority of the books written by modern Carmelites. They are a mixed bag IMO. Thank you! I'll have to check them out! Especially the history. I know she would love to learn more about the history! This is so sweet! She seems so sure of her calling. I love that! Thank you! I'm always so surprised of how consistent she's been these last few years! the pressing question: what did she ask that you looked up on the Vatican website? i joined the convent and was there for 3 months before God led me back into "the world" again. it is a beautiful life, but not for everyone! LOL! I'm almost embarrassed. I totally had to look up the Catholic definition of each of the Cardinal Virtues, because I was having a horrible time putting what they mean into words for a six year old. I'll keep her in my prayers. Would she be willing to pray for my postulant Olivia? 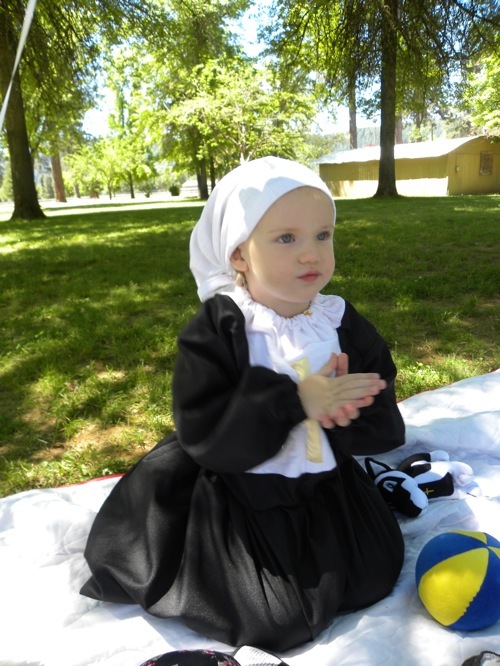 She asked to be a nun when she was three, although she wasn't as adamant about which order until she was about 7 or 8. I think she would love that! I've been meaning to show her the pictures from your trip, because I know she would enjoy them too! Wow that's so amazing!! I just love that she wants to memorize the prayer. Me too! If she actually succeeds with this one I'm going to be amazed!